Home » HRIS: Why do you need this HR Software? » Blog » HRIS: Why do you need this HR Software? An HRIS or Human Resource Information System solution enables you to accomplish basic HR tasks faster by automating processes. This HR software ensures greater convenience as compared to manual processes that involve filing or storing data in excel files. HRIS is a great employee management system particularly for SMBs which have to work with limited staff and resources. Empxtrack offers cloud-based HRIS systems, created specifically to suit SMBs. This HR software is one of the best human resource information systems that offers an experience comparable to those of expensive solutions targeting larger companies but at a fraction of the cost. With SaaS-based human resource information systems, companies do not have to invest in in-house hardware and software systems. Empxtrack’s online services ensure that updates happen automatically and new features are added regularly without any hassle. Empxtrack HRIS empowers the HR functions in SMBs by simplifying processes and reducing overall time taken. With this employee management system, records stored in a single, easily accessible, online location, HR personnel no longer need to maintain manual files. Crucial employee documents such as tax and contact details are readily available for compliance requirements without having to go through multiple files and papers. Often, SMBs have no resources to spare and need to keep on top of each employee. With an HRIS solution, companies can generate reports for customized presentations with data such as demographics, turnover, compensation, etc. Companies can avoid the hassle of creating detailed employment records by combing through different files and instead view custom reports directly. 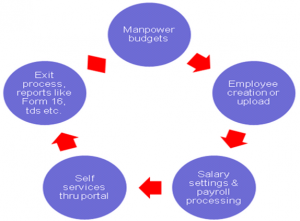 Another benefit of human resource information systems are their self-empowerment capabilities. Employees can perform simple tasks themselves like updating their address, marital status, etc. HR functions can also save a lot of time wasted in answering questions on pending leaves, holidays, benefits and other information that will now be available online. Security is not a concern as well. Empxtrack HRIS solution can specify employee access levels, allowing only executives to view performance data, approve leave requests and other managerial tasks. SMBs typically don’t have the bandwidth to support employee engagement efforts and keep up with internal developments. HRIS uses an alert mechanism to send out automated reminders, birthday or anniversary greetings, tax notices and so on. In most SMBs, time is of the essence and Empxtrack HRIS solution is one such HR software that gives them more of this valuable resource.